Pastor Robert T joined Radiant Life Church in August, 2015. A graduate of Evangel University in Springfield, MO, he has served as a regional manager for the Billy Graham Evangelistic Association, was a lead pastor in Colorado, toured and appeared in a series of videos as Bibleman, and served as a children’s pastor and evangelist. Pastor Robert T was born in Stockton, CA, and has lived in Washington, Missouri and Colorado. He has been married to Anayansi since March, 2000. They have two children. Pastor Anayansi joined Radiant Life Church in August, 2015. A graduate of Bethany University in Scotts Valley, CA, she has served as a high school para-educator, elementary school teacher, preschool teacher, tour & office manager for Bibleman, played the role of Biblegirl in live ministry events, and served as a children’s pastor in two Northern California churches. Pastor Anayansi was born in El Paso, TX, and has lived in the US, Latin America & Europe. She has been married to Robert T since March, 2000. They have two children. Pastor Simon joined Radiant Life Church in January, 2018. A graduate of the Latin American Bible Institute in La Puente, CA, he has served as a youth pastor and associate pastor in Stockton, and participated in Masters Commission in Elk Grove, CA. Pastor Simon was born in Lodi, CA, and he is a graduate of Tokay High School. Pastor Jack joined Radiant Life Church in 2018. Raised in Manteca, Pastor Jack began playing in a worship band in the seventh grade, served as a worship pastor at two churches in the Pacific Northwest, and has worked connect diverse churches through unified worship services. Pastor Jack was born in Springfield, MO, and has also lived in Washington State. He has been married to Janée since 2005. They have three children. Eirena joined Radiant Life Church in 2018. A graduate of Simpson University in Redding, CA, she has worked at a Christian camp in Northern California, and participated in missions trips to Spain, Mexico, Thailand and the US. Eirena was born in Bakersfield, CA, and is pursuing ministry credentials with the Assemblies of God. Jennifer joined Radiant Life Church in 1992. A graduate of Platte Valley Academy in Shelton, NE, Jennifer has studied at MTI Business College in Stockton, worked in the office of an insurance agency for over 20 years, faithfully leads our prayer team, and serves in early childhood for Radiant Life Kids Church. Jennifer was born in Albion, NE, and has been married to LittleJohn since 1988. They have two adult children. Mike joined Radiant Life Church in 2006. With studies at San Joaquin Delta College in Stockton, CA, and American River College in Sacramento, CA, he is a professional American Sign Language interpreter for the Deaf, and has served on the Church Board, volunteered in children’s ministries, men’s ministries, and missions team. Mike was born in Lodi, CA, and has lived in the Central Valley throughout his entire life. He has been married to Vikki since October, 2002. They have three children. Vikki joined Radiant Life Church in 2006. A graduate of San Joaquin Delta College in Stockton, CA, she is a RID certified interpreter for the Deaf, with a background in employment development and cosmetology, and has volunteered in the RLC Café, nursery, and missions team. Vikki was born in Modesto, CA, and has lived in the Central Valley throughout her entire life. She has been married to Mike since October, 2002. They have three children. Rosie joined Radiant Life Church in 1990. A retired business owner and chef, she has served in children’s ministries, catered many church banquets, and provided some of the most coveted desserts in our annual crab feed auction. Rosie was born in Niagara Falls, NY, and has lived in New York, Nevada, Oregon and California. She has raised six children, and has seventeen grandchildren, and eighteen great-grandchildren. 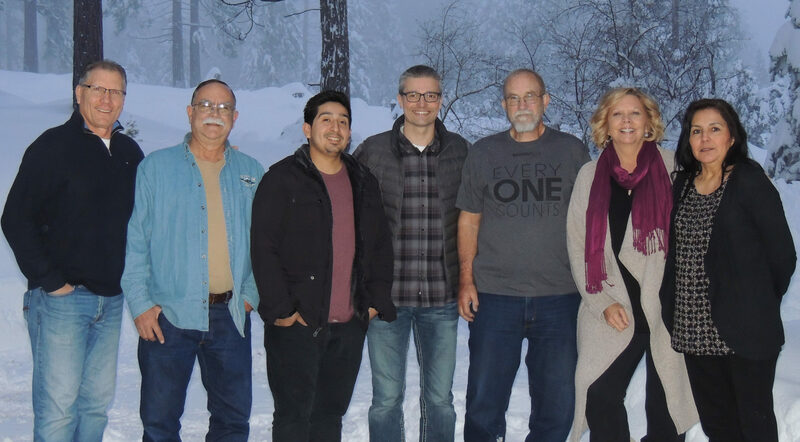 2018 Radiant Life Church Board: (left to right) Rick Lambdin, Brad Nathan, Aaron Aguilar, Pastor Robert T Schlipp, Clay Follett, April Bettencourt, and Lydia Lerma.